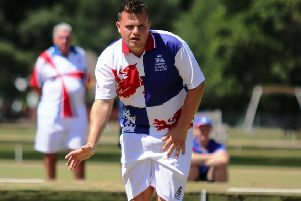 Northants Men suffered Liberty Trophy heartbreak as they went down 122-118 to Norfolk in the quarter-final at the neutral venue of St Neots & District BC. Both counties had several present or former international players in their number, at both junior and senior level, including Paul Broderick, Connor Cinato, Callum Height, Andrew Manton, Neil McKee, Danny Walker and Jamie Walker for Northants, and Mervyn King, Sam King, Daniel Seabourne, Wayne Willgress and Stephen Winter for Norfolk. The quality of play was very high, but the County just missed out after an epic encounter lasting four hours. After six ends of play scores were level, and it was still that way after 13 ends. The final third of the match saw Northants edge into an eight-shot lead with about four ends by each rink to play. But as the individual rinks finished, that lead was turned into a deficit of three as the very last end was being played, and that last end saw Norfolk collect a single shot for their overall win by four shots. Team manager Matt Pownall has selected the following team to represent Northants in the Midland Counties Warwickshire Trophy match versus Leicestershire on Sunday (January 21) at Barwell IBC in Barwell (9.30am start). NORTHANTS Men have selected the following players to represent the County in a friendly against Norfolk IBA at Desborough IBC next Wednesday (January 24, 2pm start). NORTHANTS Vice Presidents BA were 95-73 winners over Daventry in their friendly match. The VPs had three winning triples, one drawn and just one lost - they won the match by 22 shots. The highest winning triple for the VPs was that skipped by Peter Kitchener, which posted a 14 shots win, and the winning Daventry triple, with a 10 shots win, was that skipped by Norman Langdon. NORTHANTS Men took on Midland Counties IBA in a friendly at Desborough IBC, and were beaten 140-116. It was a pretty competitive match, but the County lost on all rinks, albeit by only a total of 24 shots, with no rink losing by more than six shots. That loss was in no small part to the falling away of the County’s fortunes over the last couple of ends across the green for the Midland Counties picked up 32 shots to just six conceded on those ends for their victory. DAVENTRY IBC were beaten 98-60 in their Wessex League clash with Church Gresley. The result means Daventry take just one point from the match, with Gresley taking 15.